Can Your Cat Happily Live in Two Homes Simultaneously? If you share a cat with someone and then decide to move house, you may consider the idea of your pet living in two new homes. This is particularly evident when a relationship ends and both partners have a deep attachment to their feline companion. There are also work situations that might require your cat to move back and forth between two different places. While situations like this may work for you, you might wonder whether such an arrangement is really viable or fair for your cat. As it turns out, a lot hinges on the cat's personality and the specifics of your individual situation. If you're trying to make this difficult decision, make sure you consider all of the following. Is your cat an indoor or outdoor pet? If your cat is an indoor pet, you immediately eliminate some of the major reasons why living in two homes might be problematic. If you have an outdoor cat, you need to give some thought to hazards and confusions that can result. Specifically, it might be disorienting for your cat to be shifted from place to place on a regular basis, and some cats might have more trouble figuring out how to return home (or indeed figuring out what counts as home). In addition, reduced familiarity with an area poses more risks in terms of potential road traffic accidents, so there is an argument to be made for exposing your cat to as few outdoor environments as possible. Of course, you could always consider transitioning your outdoor cat to indoor life if you plan to have the pet live in two homes, but not all outdoor cats find this transition satisfactory. What is your cat's personality like? Some cats are laid back, relaxed creatures that will adapt very easily to sudden changes in circumstances (such as moving between two different homes). In contrast, fearful, elderly or clingy cats might find it quite traumatic to be shipped between two places on a regular basis. It's very important to take your cat's unique personality traits into consideration, so try to think about other situations in which your pet was challenged to cope with change. It's also worth thinking about whether two homes will mean more exposure to unfamiliar people, as socially anxious cats might find this jarring and it could promote withdrawn or fearful behavior in both homes. 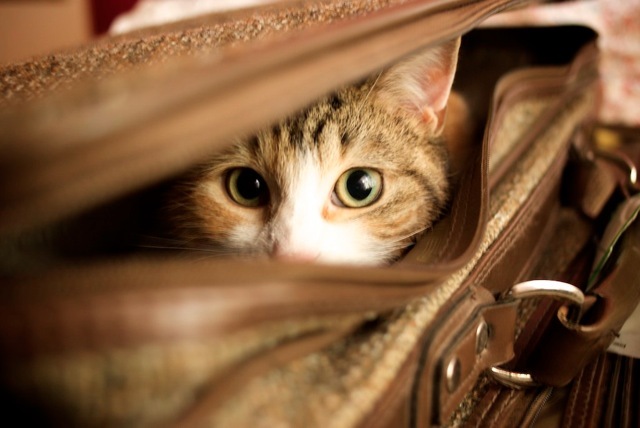 How does your cat react to traveling? Traveling is another important element of living in two homes. Even if your cat is a chilled out indoor pet, the arrangement becomes less viable if your cat hates being in the car. If traveling prompts your cat to yowl and scream, it may not be fair to ask your furry friend to endure this experience on a regular basis. However, if your cat finds car rides exciting or just boring, traveling between two homes may be viewed as no big deal. If you don't know what your cat thinks of the car, try some experimental drives and assess the reaction. Once you've taken into consideration your cat's temperament and ability to cope with change, you should hopefully be able to set up an arrangement that suits everybody! I have a situation where someone has moved in next door with a beautiful playful, friendly but young cat. She is 4. She is very small and I thought she was a kitten when she first came. I live in a shared house with 6 housemates and it is a no pets rental. Although the landlord doesn't mind, some of the others have complained that she is so persistent with getting in the door that it is really quite a pain with having her come here. I am very attached to her and for the past month have enjoyed so much habing her here. We didn't know who she belonged to at first but I found out she lives next door and the owner seems quite happy for her to come during the day whole she is at work as long as she's back by 5pm. Pixy sometimes gets stuck in my room for hrs and I think she's finding the whole experience stressful. The reason she comes is she is a very social cat and she has a brother cat at home the bullies her. She just want's somewhere quiet to sleep, wash and be loved. And that is what I want too so haha we get on very well. I am just concerned this cannot go on forever and I don't want anyone to fall out and I don't want pixy's health to be effected. What should I do? She is so persistent. Maybe I should just pull the plug and refuse to let her in before things get really bad? I'm so soft tho and I just give in and let her in. She is too cute! !